Bridge Mill Autos, Alvertorpe, (Wakefield) for vehicle servicing and mots spares and repairs. Here at bridge Mill Autos we service and repair most makes and models of vehicles from cars to light vans. 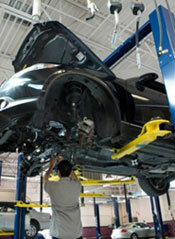 All servicing and repair work is undertaken by our qualified mechanics at competitive rates. If your vehicle requires an MOT, annual service, brakes or bodywork repairs then Bridge Mill Autos is a local first class auto centre. We provide a friendly service and give honest advice which has helped us build a strong customer base over the years. Our auto repair centre specialises in auto parts such as exhausts systems, body parts, transmissions, clutches, brakes, wheel balancing and air conditioning units. CALL BRIDGE MILL AUTOS ON TEL: 01924 375686 TO BOOK YOUR CAR OR VAN IN FOR A SERVICE, MOT OR AUTO REPAIRS.